Try ICCKER New Version Beer bottle Popper.Enjoy the craftsmanship of AMAZON'S #1 TOP RATED premium quality, sommelier-inspired waiters friend at an amazing low price! Why pay more for similar waiter's key chain when you can get this finely crafted, professional grade cap remover for so much less? If you are a bartender, waiter or server, are you feeling finger pain after removing beer bottles caps with church key? wall mounted bottle openers in a stylish and durable 430 stainless steel body with ergonomics comfort grip. It is an essential tool for your bar! And if your looking for an exceptional wedding, anniversary or house-warming gift then look no further. Our cork removers come in cool styles. With ""verified purchase"" five star reviews, more than 100,000 satisfied customers, and a 100% money back guarantee, you've got nothing to lose! It's a no-brainer to give this product a good try. THESE BEER BOTTLE POPPER SELL-OUT FAST! So don't hesitate ... scroll to the top of this page and click "Add to Cart" now! Purchase Notice: This opener is Not for screwed top bottles!! !Not for plastic soda bottles!! !Better for Glass bottle Caps!!! ★ICCKER Warranty: We believe in our product. 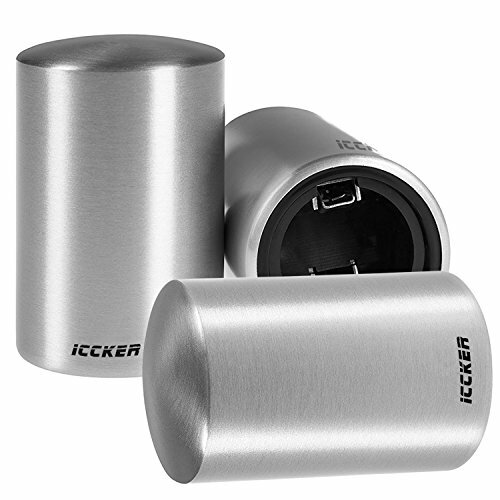 Iccker Provide every customer REAL TWO-Year No Hassle Warranty for this product.Great value for the price without risk. If you have any questions about this product by RWM, contact us by completing and submitting the form below. If you are looking for a specif part number, please include it with your message.